BY SHARON WARREN, GALLERY ASSOCIATE. When I ﬁrst visited the Pop Up Shop to collect information for this article I was lucky to meet several AGGV people closely involved in the initiative: Karen Cooper, Art Rental & Sales Consultant; John Manson, Retail Coordinator with the Gallery Shop; and Andrea Walker Collins, Gallery Enterprise Supervisor; plus several volunteer members of the Gallery. As you might expect, the overriding theme of our discussions was the love of art and enjoyment of sharing it with shop visitors. The Pop Up Shop is a temporary extension of the AGGV’s Art Rental & Sales Program and Gallery Shop. The high proﬁle, street-level location is already creating a buzz in the Fabulous Fort district offering a diverse range of local art, catalogues, books, jewellery and more. As most of us know, the Art Gallery will be closing for renovations in the near future should funding be secured. Various Gallery activities will continue in other locations and the Pop Up Shop is a great way to gauge and prepare for offsite activity. Art Rental & Sales already displays paintings at three satellite spaces including the Victoria International Airport, Nourish Kitchen & Cafe in James Bay and the Victoria Conference Centre, but the Pop Up Shop is the ﬁrst fully functioning retail outlet where you can purchase onsite. Where is the Pop Up Shop located? The current Gallery Pop Up space was donated by Parc Retirement Living owner, Rainer Muller who is known to purchase original art for his retirement communities. Mr. Muller plans to develop land which the Pop Up Shop occupies for a retirement community this summer. Art Rental & Sales and the Gallery Shop generate a signiﬁcant source of revenue for the AGGV, and the location of the Pop Up Shop is beneﬁting both outreach programs. 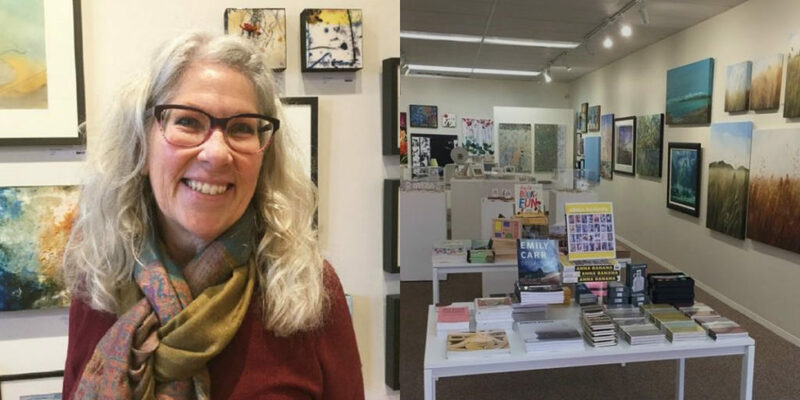 At its current location the Pop Up Shop is surrounded by specialty stores and restaurants; employees and volunteers greet up to 50 walk-in visitors a day and have sold several paintings since opening in January. 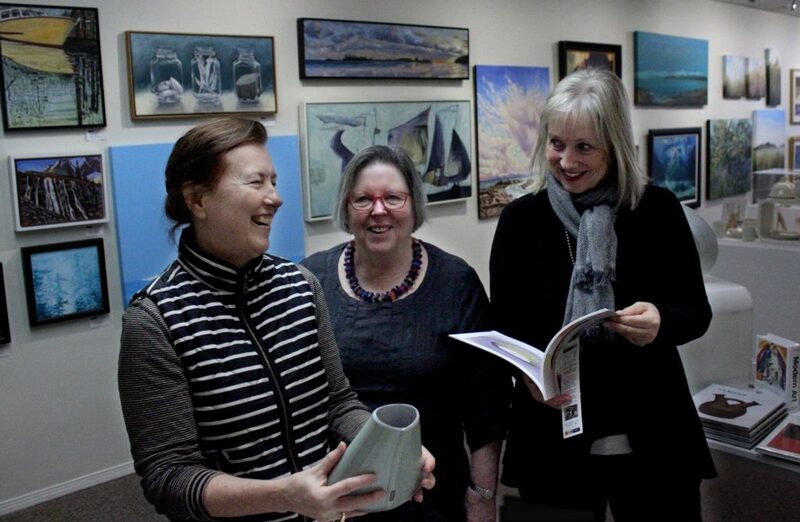 Pictured above Gallery Associate, Pat Preston with local artists Sherry Tompalski (left) and Lindy Michie (right). Why the Pop Up Shop outreach program? 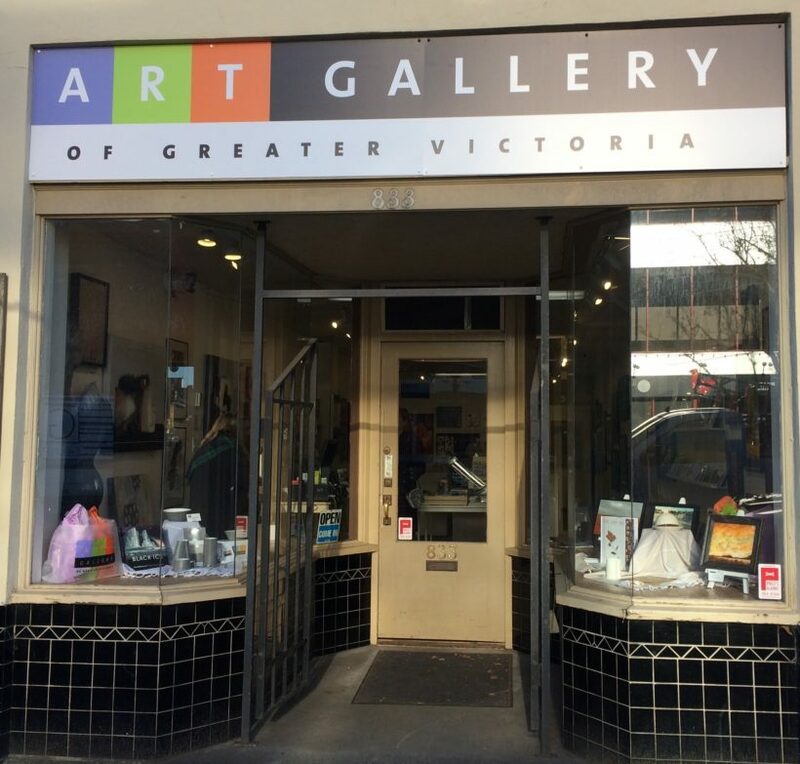 Besides the potential of housing Art Rental & Sales and the Gallery Shop during Gallery renovations, the Pop Up Shop aims to increase awareness of the Art Gallery in Victoria. Many of Art Rental & Sales’ potential clients are centred in downtown, including hotels, banks, professional corporations and interior design companies. A visible Pop Up can advertise the Gallery to groups which have never before considered it as a source of artwork. A downtown location also attracts tourists who want Island art as a souvenir. Word-of-mouth by satisﬁed buyers lets the community here and beyond know that the Art Gallery in Victoria not only displays art but also helps others ﬁnd artwork for themselves. Art Rental & Sales works. The Pop Up Shop, for example, offers paintings of different style, size and price starting at about $200, so an original could cost less than many prints. It focuses on work by BC artists, both talented newcomers and established painters like Adam Noonan, most of whom Karen knows personally. Buyers can rent a painting for several months to see how it ﬁts and apply rental fees to their purchase or choose a ﬂexible layaway plan. Karen reminded me that Art Gallery members get a 10% discount all year long and 25% in November. So the Shop offers various opportunities to bring artwork and people together. “We’re in the business of selling smiles.” Karen Cooper, Art Rental & Sales Consultant (pictured below). Save the date for the Pop up Shop Launch Party: April 12, 6-9pm | 833 Fort Street. Click here for more details. Learn more about the Gallery Associates here.